Islam & Democracy: Breaking down the Myths – Pearl Of The Islands Foundation Inc.
Greg is Research Professor in Global Islamic Politics in the Alfred Deakin Institute for Citizenship and Globalisation where he leads research on social inclusion and pluralism, Islam and civil society, democratisation, and countering violent extremism. He is the co-director of the Australian Intervention Support Hub (AISH), a pioneering collaboration between Deakin, ANU, AGD, AFP and DFAT to work with community groups in developing responses to the challenge of violent extremism. He is acting director of the Centre for Islam and the Modern World, Deputy UNESCO Chair in Interreligious and Intercultural Relations – Asia Pacific, and is active in the Global Terrorism Research Centre. For the past 20 years, Prof Barton has been active in interfaith dialogue initiatives and has a deep commitment to building understanding of Islam and Muslim society. The central axis of his research interests is the way in which religious thought, individual believers and religious communities respond to modernity and to the modern nation state. He also has a strong general interest in comparative international politics. Over the past two decades Greg has undertaken extensive research on politics and society, especially of the role of Islam as both a constructive and a disruptive force. Since 2004 he has made a comparative study of progressive Islamic thought in Turkey and Indonesia and is hoping to extend this comparative study to India. Greg is a frequently interviewed by the Australian and international electronic and print media on Islam, Islamic and Islamist movements around the world and on Indonesia and the politics of the Muslim world. He is a regular expert guest on ABC TVs News Breakfast and Sky News Australia and a variety of programs on ABC Radio National, ABC Local Radio, Radio Australia, SBS Radio and SBS TV, Voice of America (Washington), China Radio International (Beijing), BBC radio and television, Hongkong Radio, Radio New Zealand, China Central Television (CCTV), Channel News Asia (Singapore), and many others. 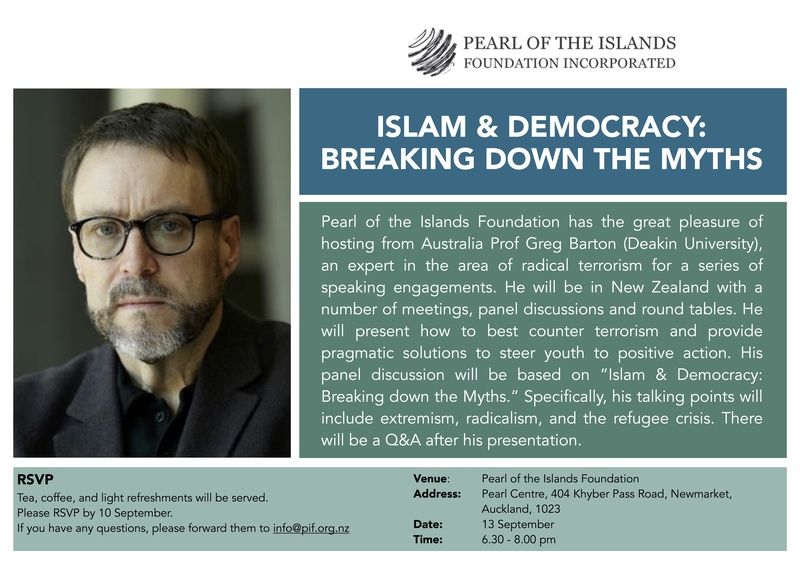 Pearl of the Islands Foundation has the great pleasure of hosting from Australia Prof Greg Barton (Deakin University), an expert in the area of radical terrorism for a series of speaking engagements. He will be in New Zealand with a number of meetings, panel discussions and round tables. He will present how to best counter terrorism and provide pragmatic solutions to steer youth to positive action. His panel discussion will be based on “Islam & Democracy: Breaking down the Myths.” Specifically, his talking points will include extremism, radicalism, and the refugee crisis. There will be a Q&A after his presentation.